Improving irrigation efficiency and drought tolerance are key challenges for the horticultural industry, particularly in the face of climate change. We have assembled a consortium of scientists with expertise in monitoring plant water relations in field conditions. The consortium is preparing to lead three distinct projects that address key issues of the industry related to increased irrigation efficiency whist maintaining productivity under climate change conditions using state-of-the-science technology. Current methods for irrigation scheduling primarily rely on measurements of soil water status, in conjunction with simple methods to calculate crop water requirements (based, for example, on rates of potential evapotranspiration and a crop coefficient). A problem with soil-based measurements is that the plant's response to soil water levels depends on many other factors, including evaporative demand (temperature, humidity), plant water transport capacity, canopy size, planting density, species, and so on. As a result, soil water-based methods, in order to be useful, still need ample calibration and tuning to the conditions of any particular orchard. We argue that direct measurement of plant water status is superior because these measurements provide direct information on the apparent stress levels experienced by the plants. Although measurements of plant water status are strongly related to plant performance and yield in a range of horticultural crop species measurement of this variable has until recently been laborious and not automated. Our approach involves deploying a new generation of wireless sensors, which provide continuous output of plant water status and water use. Data are streamed continuously and are available to farmers via smartphone and tablet applications. For the first time, these sensors allow plant water potential to be measured continuously and remotely. Data collected will aid in the development of species and cultivar specific thresholds in plant water status. This has the potential to greatly increase irrigation efficiency and improve yield in a range of horticultural crops. Precision agriculture and continuous output instruments produce large volumes of data. One of the key challenges of deploying such technologies is managing these data streams and interpreting them to immediately modify crop management. We have developed specialised skills in management and statistical analysis of large datasets. These skills will be employed in (a) processing and interpreting raw measurements of plant water status in terms of whole-tree water requirements, and (b) feeding data into a biophysical model that estimates whole-tree water use and productivity from measurements of plant water status, tree size information, and weather observations. We will survey drought tolerance of cultivars in relevant crops, including terminal shoots and rootstock, across the major growing areas of Australia, using a set of demonstrated state-of-the art techniques. This will allow us to assess the capacity of rootstock material and scions to cope with short- and long-term water reduction. We propose to use the following methods for determining drought tolerance and water transport capacity. These measurements require small samples of terminal shoots and small diameter roots, with negligible impact on tree productivity. 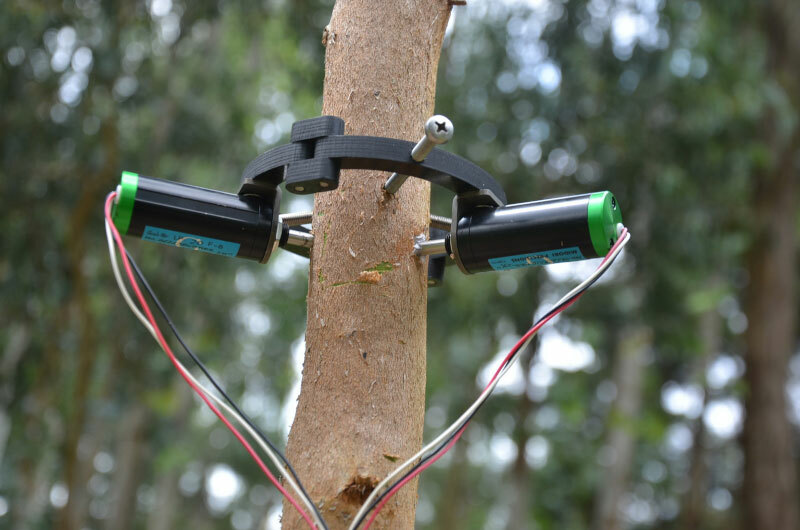 Image 1: Continuous measurement of water potential in sapwood of a tree stem using a stem psychrometer (Instrument: PSY1, ICT International, Australia). Water potential in sapwood is an ideal parameter to monitor the hydration status of a tree. 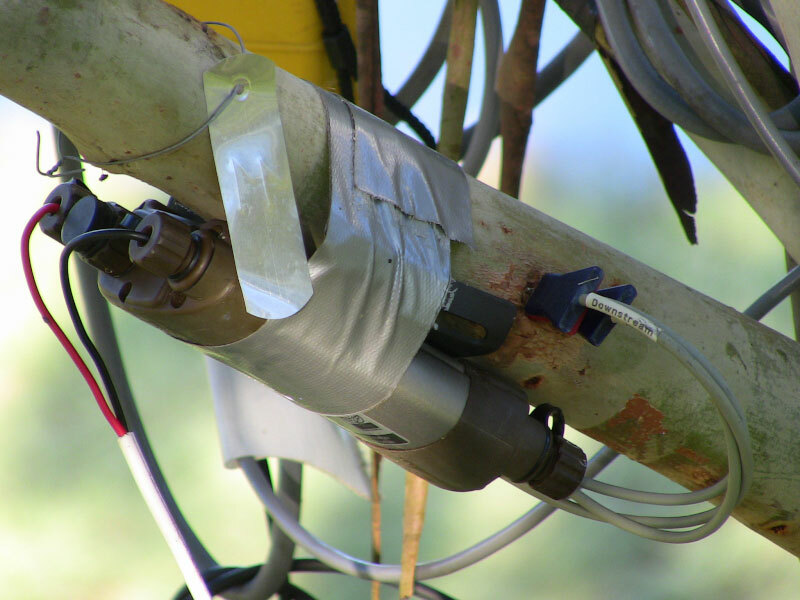 Ideally this instrument is used in conjunction with continuous measurements of tree water use as depicted in Image 3. Photo credit: Sebastian Pfautsch. 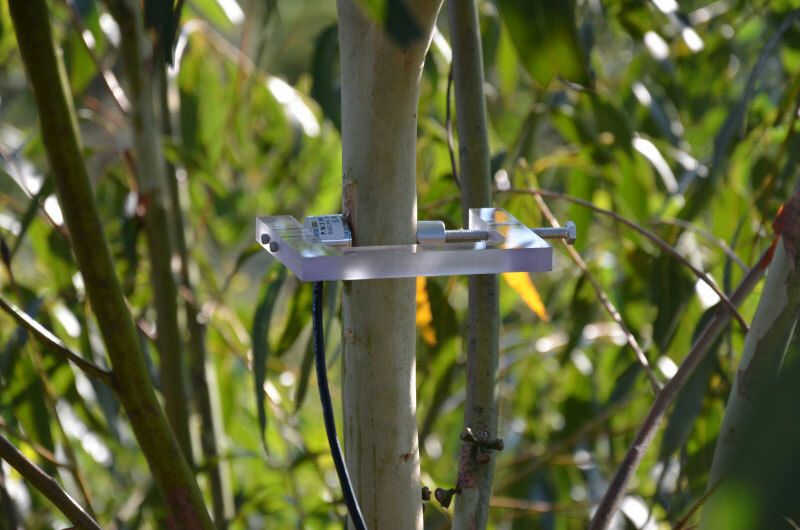 Image 3: Continuous measurement of tree water use (Instrument: SFM1, ICT International, Australia). By converting the velocity of a heat pulse in tree stems it is possible to accurately calculate the volume of water a tree actually uses under given environmental conditions. Knowledge of tree water use allows to develop strategies for precise water management of orchards and plantations. Photo credit: Sebastian Pfautsch. Major outcomes will include identification of highly-resilient germplasm for tree crops such as almonds, citrus, and sandalwood and development of a new suite of tools that will provide growers with enhanced tools for precision irrigation to maximise profitability of farm operations under new climates. Dr Choat is a Senior Lecturer and Future Fellow (2014-2018) at Western Sydney University. His research centres on plant water relations and the response of plants to drought. Before commencing his position at Western Sydney University, Dr Choat held postdoctoral positions at Harvard University and the University of California, Davis Department of Viticulture. His current research projects include the application of non-invasive imaging to plant biology and the development of automated sensors to measure plant moisture stress in situ. Dr Duursma is a Senior Lecturer at Western Sydney. His research revolves around understanding vegetation structure and function with models and data. Current and recent projects involve development of models of plant physiological processes such as plant water use, stomatal conductance and photosynthesis, canopy architecture and light interception, biomass allocation and growth. His main interest is in improving interpretation of experimental data with the use of process-based models. Dr Duursma is the main developer and maintainer of an ecosystem model that can be used to understand response of plants to changes in the environment, including climate change and water limitation (maespa.github.io (opens in a new window)). This model has been used to study water use and responses to drought in relation to management options. Dr Pfautsch is a lecturer at Western Sydney. He uses a range of techniques to elucidate how environmental change, particularly climatic extremes like heat waves and drought impact plant functioning. He studies these effects at various spatial and temporal scales, from the cellular (wood anatomy) to whole organism (plant water use, gas exchange) and ecosystem level (ecohydrology, biogeochemical cycling). For more than 10 years Dr Pfautsch has studied plant-water relations in managed and unmanaged ecosystems. Through this research Dr Pfautsch integrates climate, anthropogenic influences and natural environmental variation to advance our understanding of ecosystem functions in a changing world. Dr. Vinay Pagay is a Lecturer in Viticulture at The University of Adelaide, Waite Research Institute, where he teaches viticulture and conducts research on grapevines. Vinay received his doctorate at Cornell University (USA) in 2014 where he worked on the development of novel tools for plant water sensing. Vinay also holds a degree in computer engineering from McGill University (Canada). His basic and applied research lie at the intersection of grapevine ecophysiology and vineyard technology. His current applied research is looking into the use of proximal and remote sensing tools to obtain high spatial and temporal resolution data of both biotic and abiotic stresses in vineyards, as well as for precision irrigation scheduling. His basic research is focusing on elucidating the mechanisms involved in improved grapevine water use efficiency under reduced irrigation, specifically the roles that chemical and hydraulic signals play, as well as the role of aquaporins in regulating root and leaf water transport. Prof Arndt is based at the University of Melbourne and has extensive experience in operating sophisticated scientific instrumentation to measure carbon, water and greenhouse gas fluxes in ecosystems and water relations of plants. This includes expertise in operating eddy covariance flux towers, automated greenhouse gas measurement systems, automated dendrometers, terrestrial lidar scanners, as well as sap flow sensors, pressure chambers and various portable gas exchange devices. The research of Prof Arndt focuses on the interface between plants and their environment. He is particularly interested to understand the physiological responses of plants to their abiotic and biotic environment.